(2000) "It Began in Afrika"
"It Began in Afrika" is a song by British electronic music duo The Chemical Brothers. It was released as the first single from their fourth album Come with Us on 10 September 2001. Originally named "Electronic Battle Weapon 5" and released for DJs as a white label in June 2001, "It Began in Afrika" became a hit in clubs and was renamed for its official release. The song contains vocal samples from the track "Drumbeat" by American musician Jim Ingram. The duo created the track in 2000, premièring in December 2000 when the band supported U2. Tom Rowlands of the duo initially have mixed feelings about the track, saying it had "quite a lot of percussion, big, sweeping sort of stuff. Live conga playing, quite spaced out. It's like Body & Soul, but really, really hard and twisted, it's like high-impact, full-on, but with more organic sounds, and quite intense, without the good vibe." Regardless, though the track was popular with fans, and eventually was released as a white label release, "Electronic Battle Weapon 5", in June 2001, the fifth installment in their series of "Electronic Battle Weapon" twelve-inch singles intended for disc jockeys to play in sets. 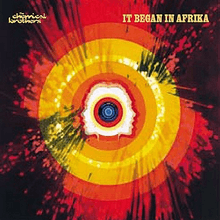 After completing their fourth album, Come with Us, the track was renamed "It Began in Afrika" and released as an official retail single on 10 September 2001. The original length of the song, which was almost ten minutes, was now edited into two different versions, the standard version of the song, which lasts eight and a half minutes, and the radio edit, which lasts three and a half minutes. The version which appears on Come with Us lasts six and a quarter minutes, seguing into the following track, "Galaxy Bounce". The single release reached number 8 in the UK Singles Chart on 22 September 2001. In addition to the full length and radio edit versions of the track, the single release also contained the B-side "Hot Rhythm Acid 1". The track received positive reviews from critics. Nathan Rooney of Pitchfork Media said the track "is a rapid, heart-pounding conga workout that distills the quick reflexes and primal urges of a cheetah hunt under a deadpan voice repeating, "It Began In Afrika-ka-ka"," and, noting its position as the second track on Come with Us, stated the album "flies out of the gates unexpectedly with its first three tracks, immediately dragging the listener through a relentless torrent of beats and sonic energy." Robert Christgau called the track the best "disco disc" on the special edition of the duo's compilation album Brotherhood. Marshall Bowden of PopMatters said "It Began in Afrika" is "a kind of electronic exotica where the various percussion (both sampled and real), big cat sounds, and travelogue narrator sample combine to create an ersatz aural safari a la Les Baxter. The polyrhythmic percussion flights (timbales and bongos) are like a cross between a Sanatana concert and the Grateful Dead parking lot. Overall, though, the track is strong and trades on the aggressive Chemical beats sound while throwing a new angle into the mix that is sure to delight listeners and dancers." In a more mixed-to-positive review, after noting the album is "steeped in retro-synth glory", Sal Cinquemani of Select Magazine said "It Began in Afrika" is "ripe with tribal beats and jungle-cat snarls (is that He-Man's Battlecat? ), swiftly building into a percussive techno jam session. The track's weakness, however, lies in its all-too-prominent spliced-up lyrical slogans." ↑ "Ultratop.be – The Chemical Brothers – It Began in Afrika" (in Dutch). Ultratop 50. Retrieved 21 February 2014. ↑ "The Chemical Brothers: It Began in Afrika" (in Finnish). Musiikkituottajat – IFPI Finland. Retrieved 21 February 2014. ↑ "Lescharts.com – The Chemical Brothers – It Began in Afrika" (in French). Les classement single. Retrieved 21 February 2014. ↑ "Italiancharts.com – The Chemical Brothers – It Began in Afrika". Top Digital Download. Retrieved 21 February 2014. ↑ "Swedishcharts.com – The Chemical Brothers – It Began in Afrika". Singles Top 100. Retrieved 21 February 2014. ↑ "Swisscharts.com – The Chemical Brothers – It Began in Afrika". Swiss Singles Chart. Retrieved 21 February 2014. ↑ "Archive Chart: 2001-09-22" UK Singles Chart. Retrieved 21 February 2014. ↑ "The Chemical Brothers – Chart history" Billboard Hot Dance Club Songs for The Chemical Brothers. Retrieved 21 February 2014.